To me, Caldwell Cigar Co‘s brand is most easily defined by the great artwork on the bands, the eclectic naming conventions (as evidenced in this review), and with producing cigars that are rich, complex, and full bodied. Today’s review focuses on the All Out King’s “Give Me Your Lunch Money.” The cigar is produced at the Drew Estate factory in Esteli, Nicaragua, and features tobaccos from an array of countries, including Indonesia. 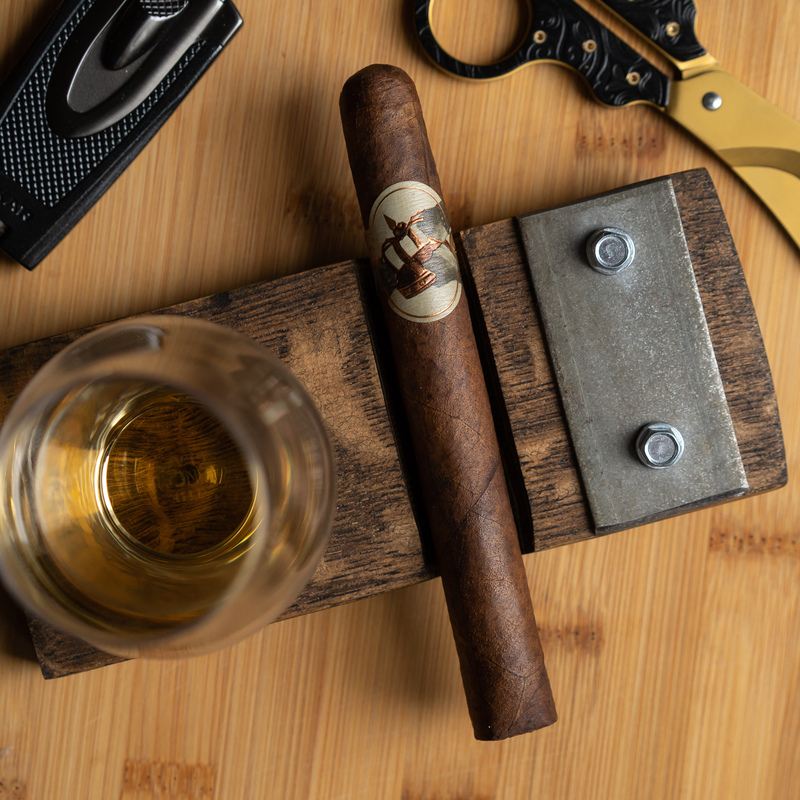 All Out King’s is the company’s first collaboration project, and, given Caldwell’s unorthodox brand, Drew Estate seems like a fitting partner in crime. The All Out King’s Give Me Your Lunch Money sports one of the most visually unique wrappers I’ve seen… ever. The variation of colors is stunning, with the leaf alternating between a light reddish brown and dark brown all around the cigar. The texture is interesting as well. There’s a light oily layer, but a visual toothiness that makes the wrapper feel leathery to the touch. After using a straight cut to cut the cigar, the draw seems to be a touch tight, about an 8/10 in terms of amount of restrictiveness. The cold draw has some granola and oats, but the aroma off of the foot is much stronger, with dry cedar, cocoa beans, and some white pepper rounding it all out. Give Me Your Lunch Money (or GMYLM for practicality’s sake) kicks off with hearty medium bodied smoke. Smoke production is good, but not quite voluminous. From a flavor standpoint, the cigar lands more toward the bitter end of the flavor spectrum, though there is a bit of sweet cocoa and a salty buttered popcorn that pops in the aroma. The base notes are bitter cedar, finely-ground black pepper and pencil lead. One thing that really catches my eye though as I smoke through the first inch is that it is mainly the back/sides of my palate that are activated by the cigar, instead of the center and tip of the tongue which is more common. As the cigar burns on, a straight white ash develops with a great burn. Just past the first inch mark, the bitter elements of the flavor profile really ramp up, leading me to take a quick break to grab a glass of water. Body at this point is at about medium, but I find the flavor strength to be way up at full. The smoke is chock full of oak and black pepper on the palate (perhaps a bit overdone) with with contrasting aromas of popcorn, floral, and dark stone fruits in the aroma. The retrohale is similarly aggressive, with heavy pepper and charred oak making up most of the flavor. The second third of GMYLM is mostly the same, with the body staying at medium and flavor staying near full. The smoke has a chalky texture, with predominantly bitter notes of oak, pepper, minerality, and some slight sweetness. There is a white pepper note that’s introduced, mainly activating on the tip of the tongue. Overall though, it’s more of the same, and at this point I’m finding the bitterness of the profile to be taxing on my palate. In the final third of the All Out King’s GMYLM, the flavors finally come into a bit more balance, with oak and pepper joined by dark chocolate, savory spices, and sweet floral. The retrohale features red pepper and generic wood. Construction remains just about perfect, with a straight burn circling the cigar and the ash holding easily for more than an inch. Not a bad way to end, but too little too late. While All Out King’s “Give Me Your Lunch Money” has some good qualities to speak for it, finesse is not one of them. If you’re looking for an elegant smoke, this is not it. But if you’re a full bodied cigar smoker, it’s worth a shot. For me, though, as much as I’ve loved just about everything I’ve smoked from Caldwell, this cigar would have to land on the bottom end of that list. The bitter, oaky elements of the smoke were just too aggressive, rarely letting up to allow other flavors a chance to shine.